“There has been vocational confusion, dark times,” my church-planting friend told me, now four years into this endeavor. Of course, I thought, there has to be vocational confusion and dark times. After all this pastor has had to wear more hats than I can imagine: visionary leader, construction foreman, preacher, worship leader, volunteer organizer, community developer, grant writer, meal planner, non-profit director, fundraiser, coffee-shop barista, spiritual director, cheerleader, landlord, entrepreneur, marketer, community events organizer, theologian, evangelist, custodian, ad exhaustium. And all that to help birth a community the vision for which is still taking shape. One wonders how pastors of new church plants survive the beginning years. What allows those who sustain this kind of ministry to do it? What keeps them from hanging up their stoles and dawning the barista’s apron full time? I suspect that though this work is a horse of a different color, the practices that have sustained pastors throughout the centuries in the widest variety of ministry settings haven’t changed. They are the practices that keep us most open and available to God, the practices that help us discover and honor our truest selves, the practices that help us stay true to the voice of vocation speaking to us from deep within. 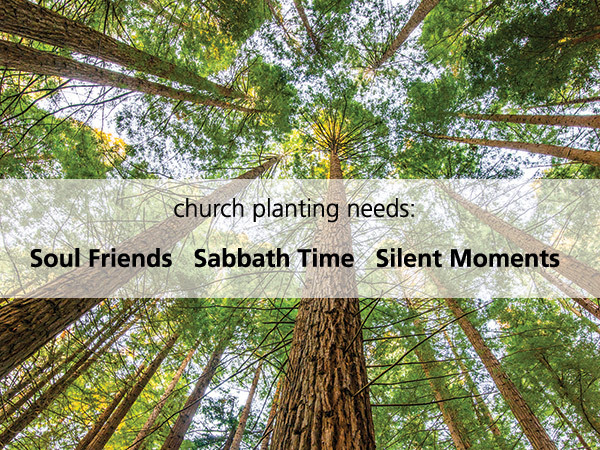 There are many, but three strike me as particularly relevant: having a soul friend, keeping a sabbath, and practicing silence. I pastored churches for eight years, and I don’t think I would have survived without my soul friend—a spiritual director. My spiritual director created the space once a month for me to do nothing but look at my life to discern how the Holy Spirit might be at work. His office was a space where I could cry, yell, laugh, and think. His office was a space where I could do the work of remembering who I truly am and why I was in this work. When the demands of ministry begin to overwhelm us, our soul friends can create the space for us to remember our deepest center in the heart of God. Second, a church-planter should consider keeping a sabbath. Sociologist Judy Wajcam has argued that we live in an era of “temporal disorganization.” Because of technology, there are fewer boundaries on our time. Work spills into family and play in a way it never has before. And this is truer, I suspect, for church-planters than for other pastors. Church-planters often have no office to go to, no staff to meet with—they lack the structures of an institution to order their time. And without those structures, the work of ministry bleeds in to every second of every day. We then can forget that it’s not our frantic agency that brings in the tides and holds the stars in the sky. There is Another at work. And that’s why God gave us a day of rest, so that we could cease from work long enough, not just to rejuvenate (a good day off can do that), but remember that it’s not our initiative that matters in ministry, but it’s discerning and joining God’s initiative that makes the difference. The work of getting things started is so close to the heart of church planting there’s all the more reason to stop once a week to remember: it doesn’t all depend on us. Finally, practice silence. In silence we get to know the voices that drive us—and often they are not the voice of God. We are driven by the need to succeed, to prove ourselves, to “get this ship off the ground” or “turn this ship around.” Many of those voices aren’t the gentle, wooing spirit of God, but are the voices of our own frail egos (and of our judicatory leaders). In silence, we can see them for what they are: smoke screens, concealing the real voice we need to listen to—the voice of God and the voice or own vocations, which, if we listen carefully enough, we might discover are one and the same. We chatted for an hour, then my friend had to hurry away. He had another appointment at nine o’clock. And I knew he had another meeting that afternoon, because it was with a friend of mine to talk about small group ministry. Then back to the worship space tonight for the weekly community meal. Such is the life of the church-planter. A life that can be sustained—and even flourish—when soul friends, sabbath rest, and silence give us the space to discern the voice of God, remember who we are, and rest in a Love that will not let us go. The Rev. Dr. L. Roger Owens is associate professor of Christian spirituality and ministry at Pittsburgh Theological Seminary and teaches courses in the MDiv, Doctor of Ministry, and Continuing Education programs. Before coming to PTS he served urban and rural churches for eight years in North Carolina as co-pastor with his wife, Ginger. He has written multiple books including The Shape of Participation: A Theology of Church Practices which was called “this decades best work in ecclesiology” by The Christian Century. I’ll be 47 years old in July. Like most second career seminarians I’ve met, I had little if any idea why I was there, and to be honest, I had little idea of what seminary was supposed to be. My life to that point had been driven by a lot of things, none of which were God. I grew up 30 miles east of the city in a small town at the foothills of the Laurel Mountains, where I continue to live. I have an undergraduate degree in business and an MBA. Most of my life, and my identity, were wrapped up in my entrepreneurial endeavors. My new found focus on God came only after the destruction of everything I thought I knew about my life and what it was supposed to be. Three years ago when I first toured the Seminary, I found myself wandering through the halls of PTS with Director of Enrollment Derek Davenport and I clearly remember meeting then Church Planting Director Chris Brown that day. When Derek introduced Chris as the director of the Church Planting Initiative that was the first time I heard the words “church” and “planting” used together. For all I knew it might as well have been an initiative intended to restore the landscaping around aging church buildings. Fast forward a few years and the creative, entrepreneurial spirit found in church planting and innovative ministry has been the easiest transition for me from self-driven endeavors to a God-driven life. I should think most everyone who knows me even a little would say it’s hard to see me in traditional church leadership/pastor rolls. Systems theorists might say I’m self-differentiated to an extreme, almost detrimental degree (extreme, almost detrimental is my default setting in life). As I have followed God through this strange blurry trip they call discernment, I’ve found myself most drawn to atypical pastoral leaders—community starters like PTS alums Chris Brown, Keith Kaufold, and Jeff Eddings. I’ve been encouraged by their determination to follow God on the terms they hear God calling, regardless of the established church world around them. Through this discernment process, I have heard God call me to the streets, to minister to Pittsburgh’s homeless population. Almost by accident, I found myself building deep personal relationships with people from the street. I’m drawn to those struggling with addiction and mental illness, those who reject society first, out of fear that given the chance society would reject them. It is in these heavy circumstances that I hear Christ calling me to those who have lost him, or those who have yet to know him. They are drawn to me, and I to them, so I minister to them on their terms and their turf, under the bridges, along the tracks, in the middle of the street. As I do, I’ve recognized how hard it is to convince someone that there is hope in a God greater than anything in this world, when their world view is constricted by the eminent need to survive the next day, the next hour, the next minute. Two years ago, Keith Kaufold and I were rafting down the whitewater of the lower Youghiogheny River with 20 teenage summer campers when I turned to Keith and said, “can you imagine what it would be like to bring people from streets here?” That was the seed that eventually would grow into Bridge to the Mountains. 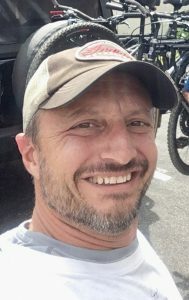 It started with a few trips bringing a few homeless individuals at a time up to the mountains to ride bikes along the river trail, ride the natural water slides, and just enjoy God’s wonder for a few hours. 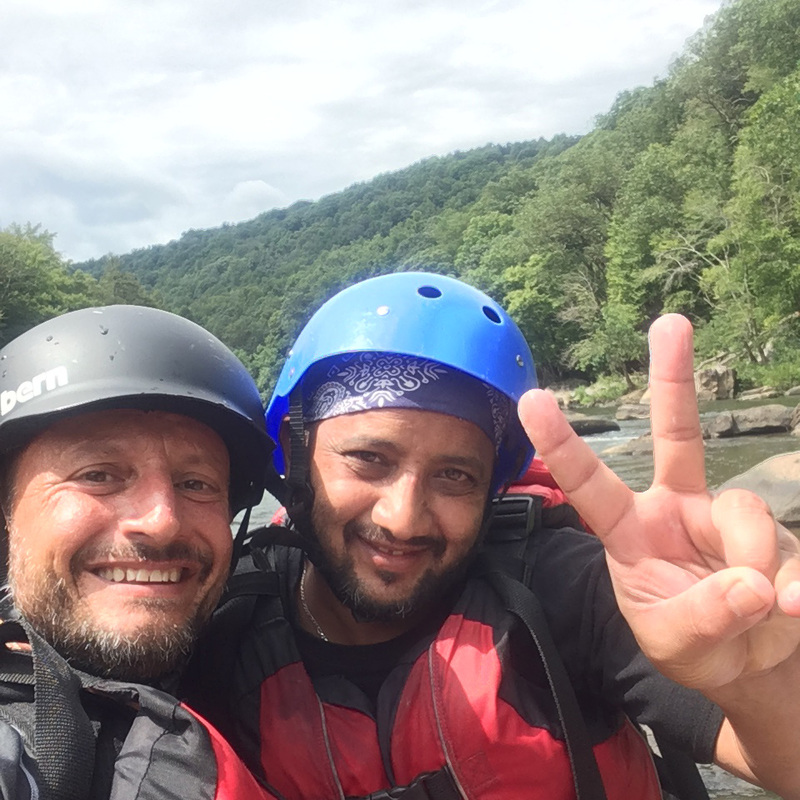 Eventually I raised some money and brought a group of 20 homeless, and homeless care providers white water rafting. That was a year ago. Today Bridge to the Mountains is a Pennsylvania nonprofit corporation, and we are awaiting our 501 (C)(3) status. 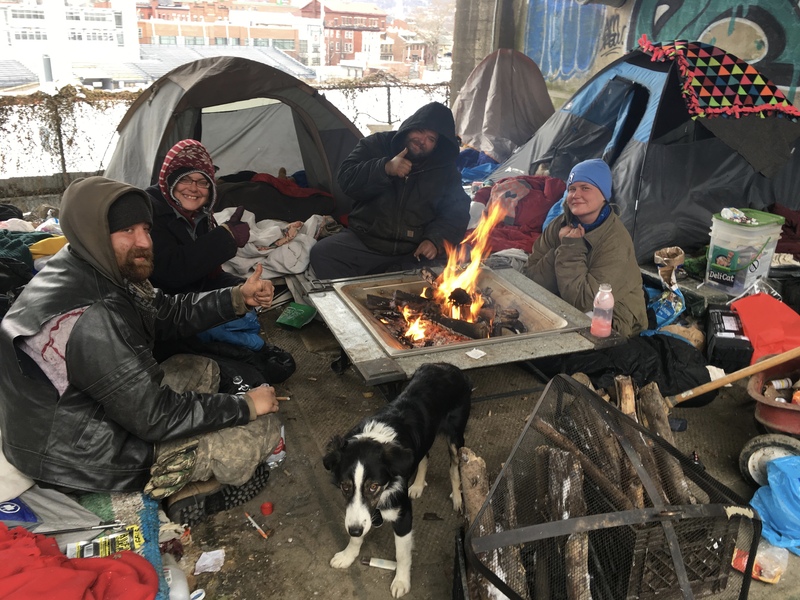 We are a Pittsburgh based Christian faith mission dedicated to developing relationships with, and providing a bridge of hope, to those experiencing homelessness, addiction, mental illness, and otherwise challenging life situations. By combining street outreach and the coordination of services with other providers throughout the city with mountain excursions of hiking, whitewater rafting, trail biking, rock climbing, and adventure courses, we believe we can create the best environment to allow an inbreaking of Christ’s peace and hope to those who so desperately need it. For more information on our ministry visit our website at http://www.bridgetothemountains.org/ or find us on Facebook https://www.facebook.com/bridgetothemountains. Dave Lettrich is a senior Master of Divinity student at Pittsburgh Theological Seminary who is also pursuing his graduate certificate in church planting through the Seminary’s Church Planting Initiative. The Rev Chris Brown (PC USA) is the former head of the Church Planting Initiative at Pittsburgh Theological Seminary and a founding co-pastor of the Upper Room Church Community in the Squirrel Hill neighborhood of Pittsburgh. The Rev Keith Kaufold (UMC) created Eighth Avenue Place in Homestead, Pa. And the Rev Jeff Eddings (PC USA) is a founding co-pastor of Hot Metal Bridge Faith Community in Pittsburgh’s South Side neighborhood. Recently 250,000 football fans gathered on the Benjamin Franklin Parkway in Philadelphia to witness the NFL draft and boo the living daylights out of NFL commissioner Roger Goodell. It’s cold comfort to Commissioner Goodell but he’s not the only one to ever divide opinions on that proud avenue. The Parkway is home to priceless collections of art, luxury hotels, and spendy condos. 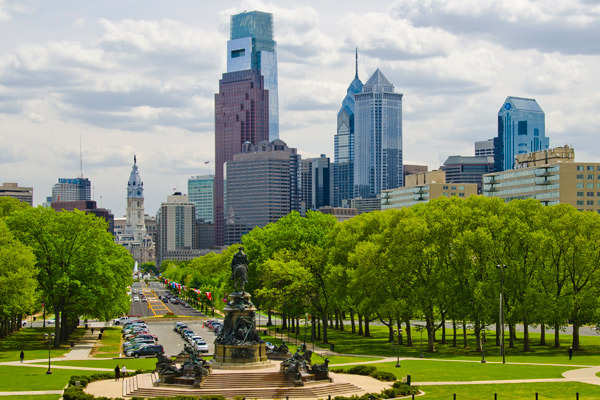 Likewise, the Parkway is also home to many of Philadelphia’s most vulnerable residents—people experiencing hunger, homelessness, and poverty. Consequently, the Parkway is where many people of faith pull up in station wagons and pick-up trucks, unload soup and sandwiches, and ask people to form a line. You can picture the battle lines: NIMBYism, shame-the-rich-ism, scaring away the museum customers, first amendment rights to religious expression – the whole shebang. The church I used to serve, Broad Street Ministry (BSM), was less than a decade old and we were trying to figure out our identity, particularly in our civic space. It started in 2005 as a church plant focused on an alternative church community. BSM seeks to be dynamic in its expression of worship, embracing those both on the margins of faith and those who have enjoyed the embrace of the church. We decided to position ourselves like this: We are not against outdoor feeding and we are in favor of indoor dining. We invited our brothers and sisters in the faith as well as our friends in the hospitality industry to come work with us at the church, serving excellent chef-prepared meals to vulnerable people indoors without having to stand in a line. Overwhelmingly, the people who responded in the affirmative to our invitation were the big bad capitalist hoteliers and restaurateurs. They responded to our claim that hospitality is hospitality, regardless of ability to pay, and soon they were treating us like colleagues in the hospitality industry. We church and nonprofit types were becoming friends with servers, bartenders, chefs, and general managers because we had so much in common. The GM of the Four Seasons asked me to officiate his wedding to his partner of 16 years. Incredible new possibilities for partnership emerged. Steven Cook and Mike Solomonov, the James Beard Award winning duo behind CookNSolo restaurants approached us with an idea. They ran a fried chicken and donuts chainlet called Federal Donuts that was throwing out at least 500 pounds of chicken backs and bones per week. Could they make stock out of that and provide us with chicken soup in perpetuity? We at BSM knew our identity wasn’t a soup kitchen so serving soup every day would send the wrong message, plus we had a chef who did incredible work. So together we arrived at a related idea: Let’s turn the backs and bones into soup, sell the soup to the public, and donate the proceeds to BSM. In the three years since that conversation, we raised $180,000 via Kickstarter and a bunch more from several foundations, gone on lots of charm offensives armed with donuts and delicious Israeli food from their restaurant Zahav, and become great friends and confidantes. Oh, and the Rooster Soup Company, a classic luncheonette donating 100 percent of its proceeds to BSM’s hospitality work, opened to favorable write-ups, like this one in Bloomberg. GQ called it one of the 10 Best New Restaurants in America. When my spouse, Karen, and I were considering whether we should move to Pittsburgh, Steven and Mike, both with roots in Pittsburgh, were instrumental in helping me picture life in a new town. Steven listened well, held my ambivalence about a new call and, of course, made restaurant recommendations. Mike even made a warm introduction to a chef in town who was hiring for his Lawrenceville restaurants in case I wanted full-time kitchen work. When the conflict on the Parkway was fomenting, I was certain I would emerge with deeper relationships with my sisters and brothers enacting their Christian faith. Instead, two secular Jews who run some of the best restaurants in the country became lifelong friends and partners who shared a vision for caring for vulnerable people in Philadelphia and who helped me understand God’s vision for my life. Too often, our own conception of who our adversaries will be prevents us from seeing the allies, friends, and co-conspirators right in front of us. What is the unlikely partnership you haven’t considered? When in Philadelphia, consider dining at one of Steven Cook and Mike Solomonov’s restaurants: Zahav (Modern Israeli), Abe Fisher (small plates inspired by the American Jewish experience), Federal Donuts (fried chicken, donuts, and coffee), Dizengoff (hummus), Goldie (vegan falafel), and, of course, the Rooster Soup Company. The Rev. Andy Greenhow came to Pittsburgh Theological Seminary from Philadelphia, where he served as the pastor and director of faith and worship at Broad Street Ministry, a missional faith community of the PCUSA. He has also served as a chaplain on a locked psychiatric unit, as the director of young adult ministries at a large suburban church, and as a construction worker rebuilding houses destroyed by Hurricane Katrina in New Orleans. Andy currently serves as the Seminary’s interim dean of students.